This image, taken from YouTube, shows a youth in a MAGA hat staring at and standing extremely close to Nathan Phillips, a 64-year-old Native American man singing and playing a drum, at the Indigenous Peoples March in Washington, Jan. 18, 2019. A diocese in Kentucky apologized Saturday after videos emerged showing students from a Catholic boys high school mocking Native Americans outside the Lincoln Memorial after a rally in Washington. Other students, some wearing Covington clothing and many wearing "Make America Great Again'' hats and sweatshirts, surrounded them, chanting, laughing and jeering. According to the Indian Country Today website, Phillips is an Omaha elder and Vietnam veteran who holds an annual ceremony honoring Native American veterans at Arlington National Cemetery. 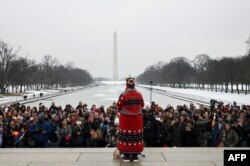 A woman speaks during the Indigenous Peoples March on the National Mall at the Lincoln Memorial in Washington, Jan. 18, 2019. "I felt like the spirit was talking through me,'' Phillips told the newspaper. “The behavior shown in that video is just a snapshot of what indigenous people have faced and are continuing to face,'' Buffalo said.